Hello Hello. Sorry so long for an update, but I've been hard at work for this here show. 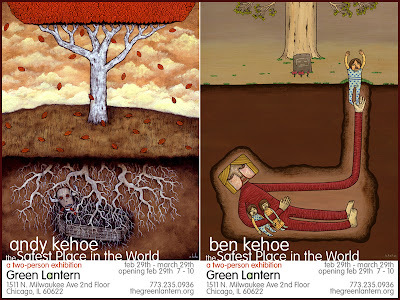 It's a two person, one-family crackerjack extravaganza featuring myself and my brother Ben... well, not so much an extravaganza... just an art show called "The Safest Place in the World." It's great to have a show with my hermano and the show's shaping up to be a dandy. So if any of you are in the Chicago area, you should drop on by and we'll talk about Chicago things.